Julie Gough (born Melbourne, 1965), is an artist, writer and curator who lives in Hobart. Creating predominately mixed media and installation work, Gough’s art and research focuses on uncovering and re-presenting conflicting and subsumed histories. Much of her work refers to the impact of colonialism, and her own family’s experiences as Tasmanian Aboriginal people. Julie has exhibited widely in Australia, and her work is represented in major state, national and private collections. Most recently Gough was guest curator at the Tasmanian Museum and Art Gallery, developing the exhibition Tayenebe: Tasmanian Aboriginal women’s fibre work, that opened in July 2009.
of escape and violence. Interactions in this colonial landscape were uneasily shared by Aboriginal people, convicts, the ‘landed’ and the desperate. 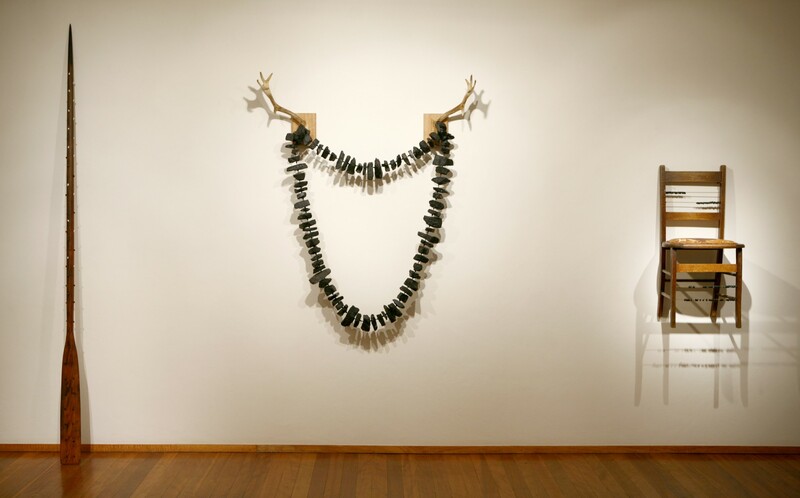 These works form a statement about such relationships, and the materials are gathered from Tasmanian places: coal from Fingal Valley, Break of Day, shells from the East Coast of Tasmania, a chair and oar from second-hand dealers, antlers from a descendant of a colonial family, allied then and now to Aboriginal people. Visually tendered to present a state of transition between nature/culture, indoors/outdoors, this piece is about my inherited tension in both wanting and fearing to understand all of my ancestors from this period: Aboriginal, convict and ‘free’. Fugitive History in part reflects the pressure on Aboriginal people to conform culturally with the West in order to survive. The chair is an abacus – able to quantify change, difference, and loss between then and now; the spear/oar is both and yet neither – uncertain of its status; the necklace formed from basal earth and strung with the darkest coal of central Tasmania reflects the sadness of my distance from the shell necklace tradition once worn everyday by Tasmanian Aboriginal women, and now maintained by precious few.